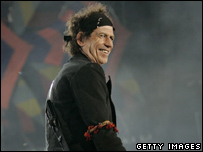 Rolling Stones guitarist Keith Richards does not need brain surgery after suffering a head injury. Some reports speculated that the rock star would need blood to be drained from his brain after the accident on holiday in Fiji last week. But spokeswoman Fran Curtis said: "He's feeling good and in good spirits." Richards, 62, was flown to hospital in New Zealand after reportedly falling out of a tree. He was officially said to have suffered "mild concussion". The band are due to start the European leg of their world tour in Barcelona on 27 May. Ms Curtis said the concert would go ahead as planned but did not know when Richards would leave New Zealand. The guitarist reportedly fell out of a coconut tree while staying at an exclusive resort in Fiji, although this has not been confirmed. He was airlifted to Auckland's Ascot Hospital for observation last weekend, where he had a brain scan before being released earlier this week. Richards, known for his hedonistic lifestyle, was voted rock's top hellraiser in a poll last year. The Rolling Stones have already played in Japan, China, Australia and New Zealand as part of their A Bigger Bang world tour.